That pic of the sauce itself is not as good at the next, but just check out the ingredients… sugar cane juice, kuchela (I’ve not heard of this and will have to do some research), rum, pineapple, coconut… WOW! What a great burst of flavor these all bring to the mix. Texture & Appearance: – Very chunky and thick, with a rich texture – great “cling” factor too. Minus 1 star for a lack of visible woody herb pieces as seen in other jerk sauces. I could eat this out of a spoon. 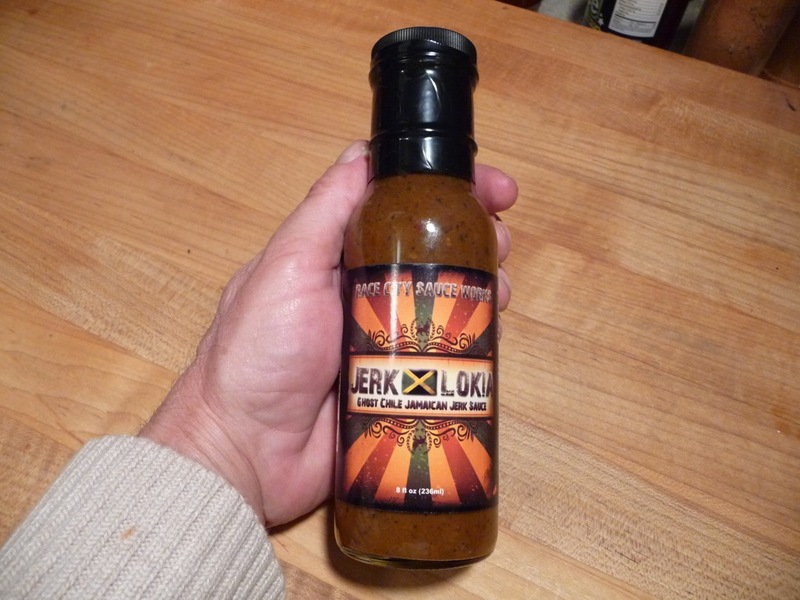 Taste: – Incredible authentic jerk flavor – spices, fruits, heat… just superb! Minus 1/2 star for too much heat. But the heat does come on quickly and goes away quickly, so that’s a big plus. 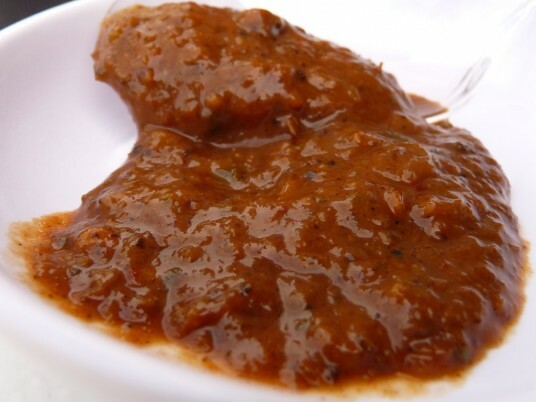 You get smacked in the mouth with it, and it goes away fast enough to enjoy the flavors of this complex sauce. Label/Graphics: – I’m happy to see Race City move away from the glossy, racetrack labels that they began with, and more into a darker, artistic vein. Regardless of the labels, the sauces speak for themselves. Fantastic! 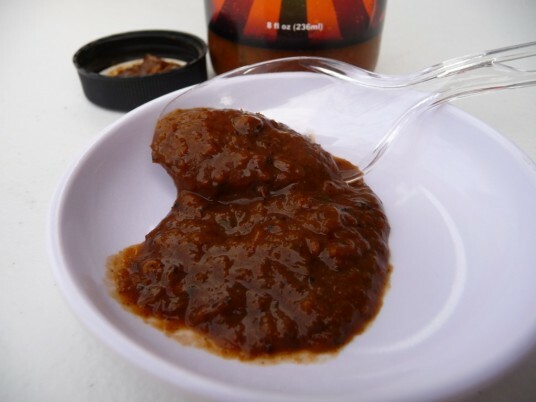 As a matter of fact, Scott Roberts named Race City Sauce Works Manufacturer of the Year for 2011 – high praise indeed! Overall Rating: – Our highest rating! Just a fantastic, delicious jerk sauce all around. Thankfully the really big hit of heat fades quickly, and the overall authentic flavor lingers. 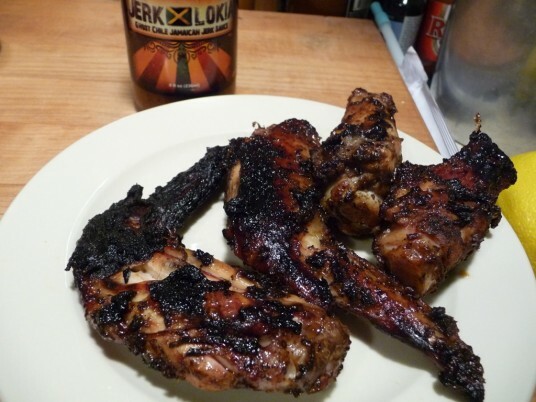 This is one of the best jerk sauces we’ve ever tried. Jerk fans, get yourself a few bottles of this… it’s over the top good! 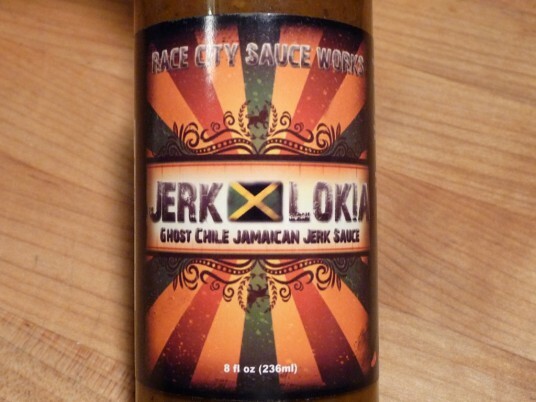 You can order Jerk Lokia and other Race City Sauce Works products here. Bookmarking this one for sure. As with most of Chad’s sauce, this is a awesome jerk sauce. 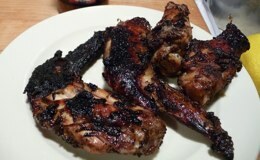 The flavor along with the heat(not too much for me…;p) makes an a wonderful jerk chicken. Thanks Ryan, I think Race City Sauce Works has matured, and I’m liking the new labels and artwork. Definitely. RCSW has totally changed for the better, it seems. Chad has totally changed the look of the sauces and with the new additions to his line, it seems like there is nothing but good things for the company’s future. I do NOT miss the woody aspect. Love love the flavors in this sauce, and I am not a jerk fan. Great product, Chad! I am doing a project in school and need to describe the aroma, and flavour profile of Jamaican Jerk Seasoning. Since you seem like a veteran jerk sauce taster, you would be able to perfectly describe what the flavours are! So if you can help it would be extremely appreciated!